He’s not in the Irish top ten rich lists (14th In 2012), claimed embarrassment when he received a medal from his home city, and famously took Facebook to court over a fake account scam and won. 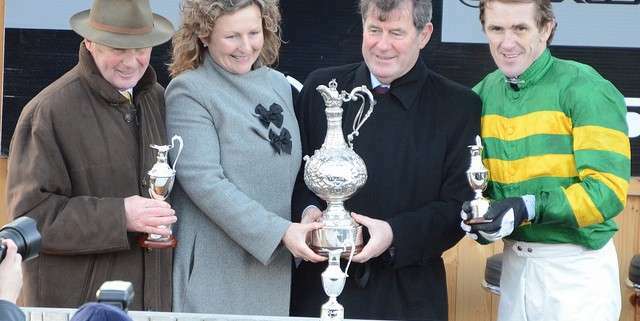 Born in Limerick on March 10th, 1951, John Patrick (J.P.) McManus was educated at the Christian Brothers School in Limerick, inheriting his love and knowledge of horses from his father, Johhny, who kept show-jumpers. The young McManus also loved a flutter and by the age of 9, he realised that his knowledge of horses could pay off. 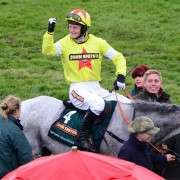 The story is told how, when sitting his Leaving Certificate history exam, his priority was to place a bet on a horse that he fancied. Finishing the exam early, he cycled to the racetrack arriving just in time to see his horse come in first, far too late to place his bet. Even so, although he missed out on his winnings, he did pass his examination, so the day wasn’t a complete waste. JP, as he is known to his friends and followers, began his career working in his father’s construction business. 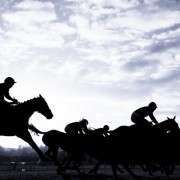 But in 1970, when JP almost 20, a £4 bet in a Newmarket maiden saw a horse called Linden Tree change his life for ever. Linden Tree romped in at 100/8 and JB came away with a £50 profit, firing his lifelong obsession with gambling and all things racing. JP reinvested £4 of his winnings on that same horse in the Observer Gold Cup, a bet which returned £100 when it came in at 25/1, and a further fiver each-way at 33/1 on the Derby saw the horse coming up trumps yet again when it came in a close second behind the champion Mill Reef. Quitting the construction business JP became a bookmaker, setting out his stall at Limerick’s Market Field greyhound track. His success as a bookie soon enabled him to buy his own racehorses and become a big-money punter earning him the nickname “The Sundance Kid” for his huge and mostly winning bets. At around this time JP also became an accomplished backgammon player and in 1982 he and his wife, former nurse, Noreen, bought 400 acre Martinstown Stud in their beloved County Limerick. McManus's first horse was Cill Dara, and from those early beginnings he grew his stable to become National Hunt racing's largest owner with over 400 horses in training. He’s well known in the racing world to both fans and professionals alike, but even so in many ways he’s something of an enigma. 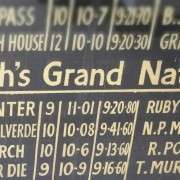 In 2010 JP's dream of winning the Grand National was fulfilled by his horse ‘Don't Push It‘ ridden by champion jockey A.P. McCoy. 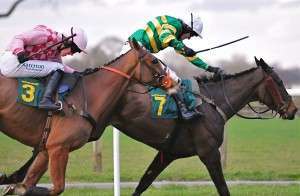 McManus often has multiple entries in the Aintree race; five runners in 2004, six in 2005, four in 2006, two in 2007, four in 2008, four in 2009 and four in 2010. It's easy to spot a JP McManus horse, as his jockeys always wear the owners distinctive silks – green & gold hoops. Don't Push It was recently retired after failing to return to previous form. 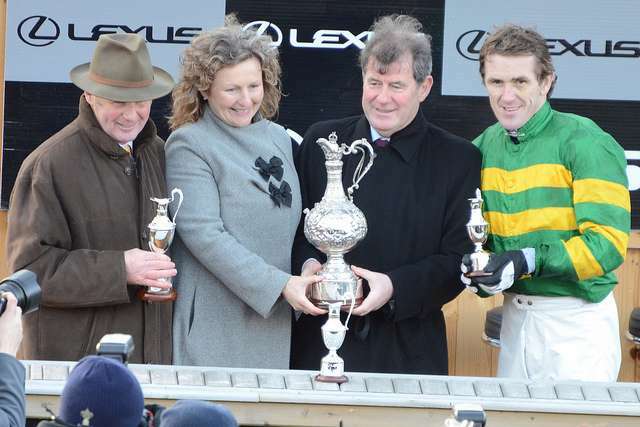 Trainer Jonjo O'Neill added: ‘The whole yard, and especially Tony and JP, owe him everything. 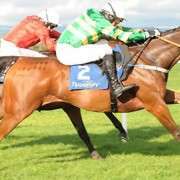 He was also mine and JP's first National winner and obviously means the world to both of us. A significant part of his wealth comes from private foreign exchange trading. 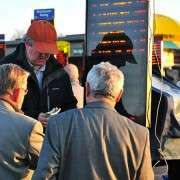 Currencies are his speciality and, as with horse racing, his bets on currencies are huge. His personal fortune is estimated to be anywhere between 480 and 900 million pounds and at its peak is rumoured to have been double the higher figure. He has a wide portfolio of investments from leisure centres and betting shops to pubs and nursing homes. He’s a big shareholder in Ladbrokes and, together with John Magnier with whom JP part-owns the sumptuous Sandy Lane hotel complex in Barbados, built up a 28.89 per cent share in Manchester United before selling it to businessman Malcolm Glazer. Alongside his impressive sporting and business empires, which he oversees from an office in Geneva, he remains a true entrepreneur and philanthropist, focussing on his native Limerick. In 1996, he established the J. P. McManus Scholarship Award which provides £5,000 each year for eight selected students at his former secondary school in Limerick. In 2004, he set up ‘Sporting Limerick' which sponsors Limerick GAA teams. JP has been awarded an honorary doctorate in economic science from the University of Limerick and funded the Kemmy Business School at the University. Odd day or not, it’s clear that no matter where he may be John Patrick McManus remains a man of Limerick. 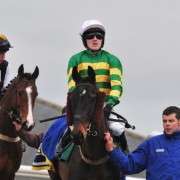 http://www.grand-national.me.uk/wp-content/uploads/jpmcmanus-apmccoy.jpg 427 640 Simone Wright http://www.grand-national.me.uk/wp-content/uploads/gn-logo2016green.png Simone Wright2012-01-17 19:37:362018-05-03 13:47:27Who Is JP McManus?